Just as there’s a proper way to shut down your laptop, there’s a proper way to remove any USB device or external storage drive that you have plugged in. Sure, you can just yank the USB drive out of the USB port of your laptop — but by doing so, you run the risk of losing some important data or seeing the fabled Blue Screen of Death! Locate the Safely Remove Hardware icon on the system tray. 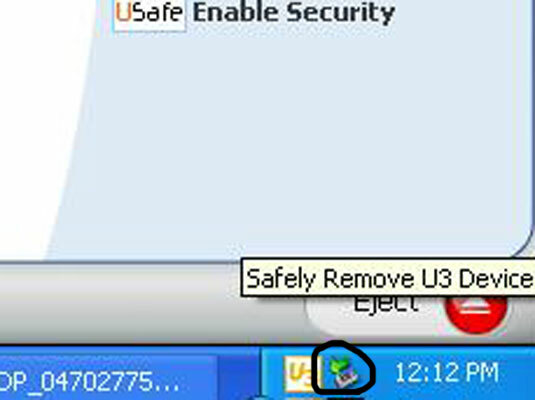 The icon is different for Windows Vista and Windows XP. Not to mention that the icon isn’t the easiest thing to see. Click the Safely Remove Hardware icon. A pop-up menu appears (after a brief pause), listing the removable storage devices attached to your laptop, as shown here. Click the device you want to remove. Note that the description varies, but you can pretty much guess which device it is you want to disconnect. 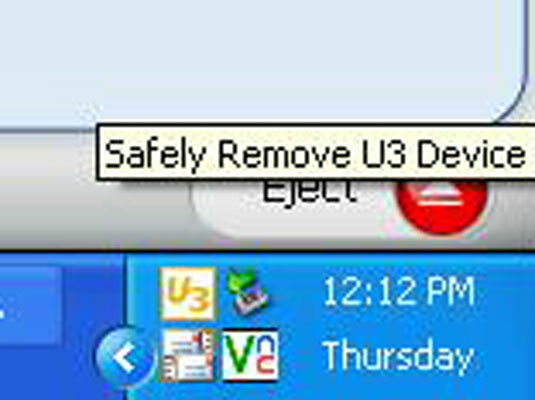 If all goes well, you see an announcement that the device can be safely removed. Unplug or remove the device. The whole idea here is that you don’t want to yank a storage device from your laptop before your software is done using it. Despite the fact that USB hardware can be hot-swapped, unplugging something that’s in use means that you can lose files — a bad thing. If you see a warning that the device cannot be removed, or “stopped,” click the OK button. Locate whichever programs have open data files on the drive, save those files, and then close the programs. That should allow the drive to be removed.